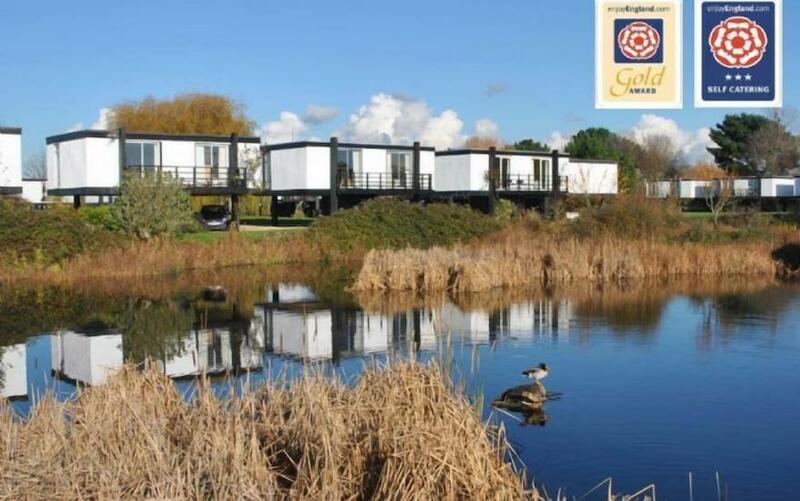 Chalet 13 is decorated with a true nautical theme and is situated in a wonderful place within the park. The chalet has parking directly outside the front door with plenty of outside space for you to enjoy your surroundings. 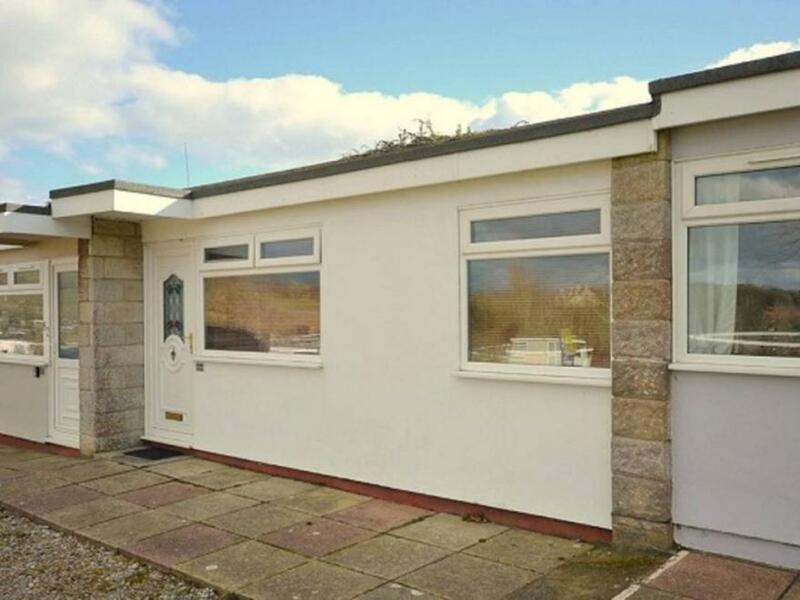 The chalet is a short walk to the coastal path which allows for many hours of cliff top walks and a very short walk to the large beach which is dog friendly all year round. The chalet sleeps 5 and has everything you will need for your stay except guests must bring towels. Guests will have access to the entire property Sandown is an old English seaside town with a Pier and amusement arcade, crazy golf, dinosaur museum, zoo and plenty of seaside shops The number 8 bus stops just outside the site with hourly trips to Newport and Ryde Electricity is paid for via a coin meter that takes 1 and 2 coins. In the summer it costs between 1.50 and 2 per day however in the colder months with all of the heating on this can be considerable more. Pebble Beach 132 is a forest lodge situated in the village of Kingsdown in Kent. Hosting three bedrooms; a double, children's bunks, and a twin, along with a family bathroom, this property can sleep up to six people. Inside you will also find a cloakroom, kitchen and an open plan sitting and dining area. To the outside is off road parking and a decked area to the front with furniture. Resting in a charming location with lovely scenery, Pebble Beach 132 is a cosy getaway in a wonderful part of England. Our Chalet is bright, airy and comfy as well as having every provision for you holiday with us. The chalet has 2 bedrooms containing a double and a set of bunks sleeping 4 and a sofa bed in the living area that sleeps 2 so 6 people can sleep very comfortably. 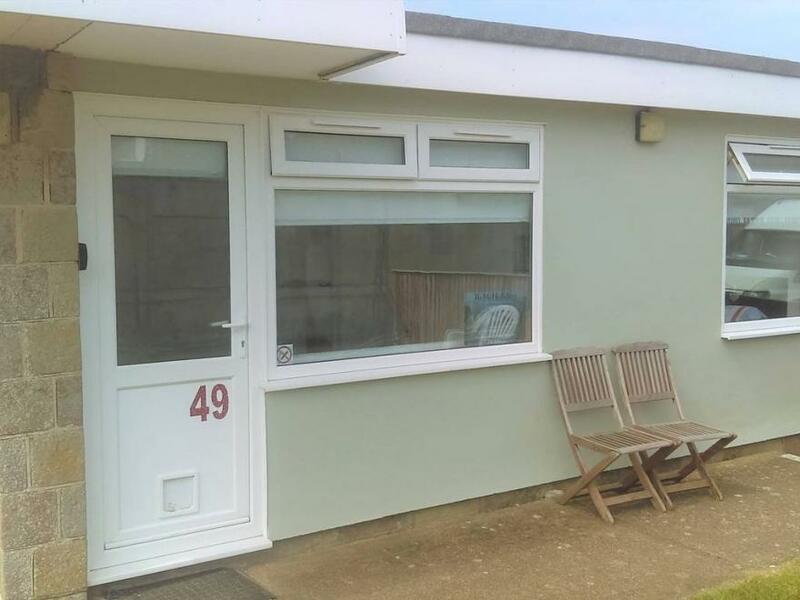 The chalet has a small patio to the front with a bench and is a short walk from the wonderful beaches of Sandown. The chalet is ideally located for exploring the island and is also located on transport routes to make exploring easier. Guests have access to the entire property Sandown is an old English seaside town with a Pier, Crazy Golf, Dinosaur Museum, Zoo, large playground and lots of seaside shops. The number 8 bus stops at the entrance to the site and runs hourly between Newport and Ryde. Electricity is paid for via a coin meter that takes 1 and 2 coins. In the summer it costs between 1.50 and 2 per day but in the winter with all of the radiators on it will cost considerably more. 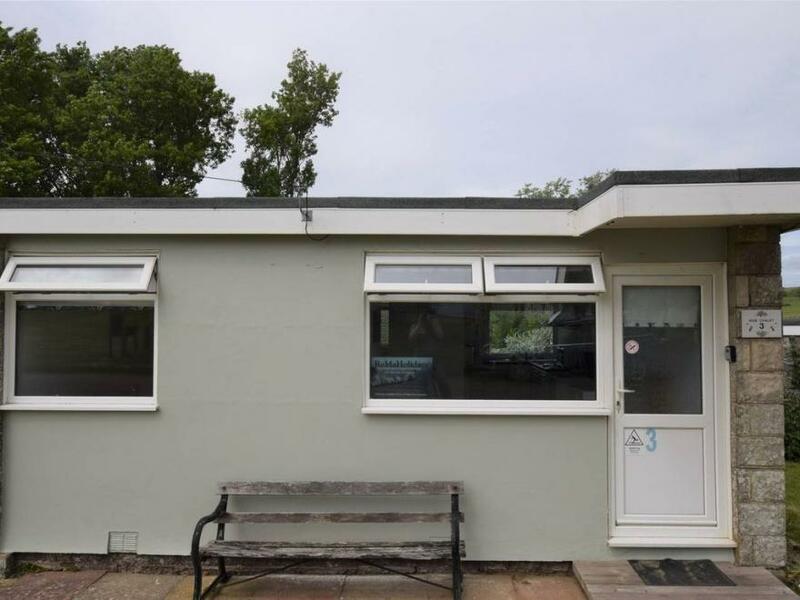 45H Medmerry Park Holiday Village is a single-storey detached chalet on Medmerry Park Holiday Village near Earnley, seven miles from Chichester. The chalet has a family bedroom with a double bed and a triple bunk, along with a bathroom and an open plan living area with kitchen, dining area and sitting area. Outside is a courtyard patio, parking in the holiday village car park, and communal grounds including a children's playground, crazy golf and an open air swimming pool. 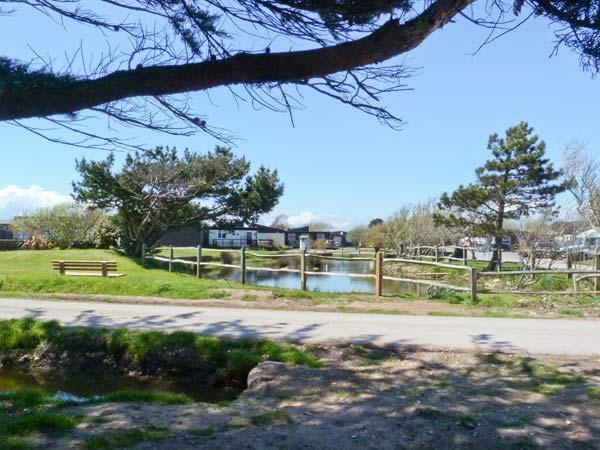 45H Medmerry Park Holiday Village is a short walk from the beach, and with the amenities of both Earnley and Chichester within easy reach, not to mention the glorious Sussex countryside on the doorstep, it makes a perfect family base. Our Amazing Chalet is bright, airy and comfy as well as having every provision for you holiday with us. The chalet has 2 bedrooms containing a double and a set of bunks sleeping 4 and a sofa bed in the living area that sleeps 2 so 6 people can sleep very comfortably. 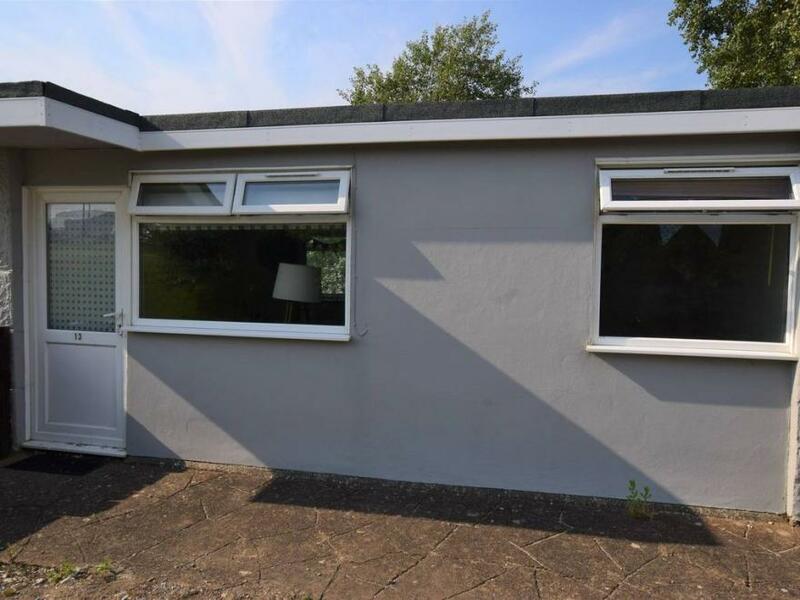 The chalet is close to the cliff with sea views and is a short walk from the wonderful beaches of Sandown. The chalet is ideally located for exploring the island and is also located on transport routes to make exploring easier. The guests have access to the entire property We are available to help you throughout your stay. We can be reached on the number provided to you. Sandown is an old seaside town that boasts a long pier with amusement arcades, a zoo, dinosaur museum, crazy golf, childrens play park and many seaside shops. 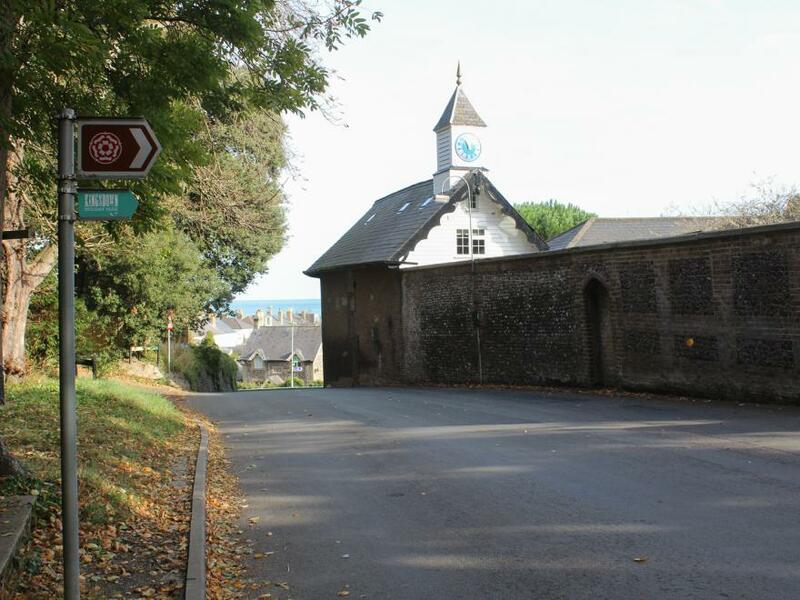 The number 8 bus passes the site hourly as it travels between Newport and Ryde The electricity in the chalet is paid for via a coin meter, that takes 1 and 2 coins, which you will need to top up during your stay. The average cost is about 1.50 per day however it will be considerably higher in the colder months when the heating is being used.. You will have some electricity for when you arrive and we have more 1 coins available should you need some. ******************IMPROVEMENTS****************** ******15% discount on all Xmas/New Year bookings****** Installation of new kitchen, bathroom, underfloor heating, new table 6 chairs. This property has a nautical theme when you enter the front door into the living/dining room, large table to seat 6 persons, 3&2 seater sofas, flatscreen TV, chest of drawers, chest full of kids toys. The rest of the ground level consists of Kitchen that has 4 burner cooker/oven, fridge, microwave, pots, pans, utensils, etc. 3rd bedroom with bunk beds, toilet shower/bath sink. Upstairs there is the 2nd bedroom with 2 single beds, the master bedroom has large double bed with storage cupboard. Our Chalet is bright and colourful and has every item to make your stay wonderful. We are situated at the front of the park with parking outside the front door. 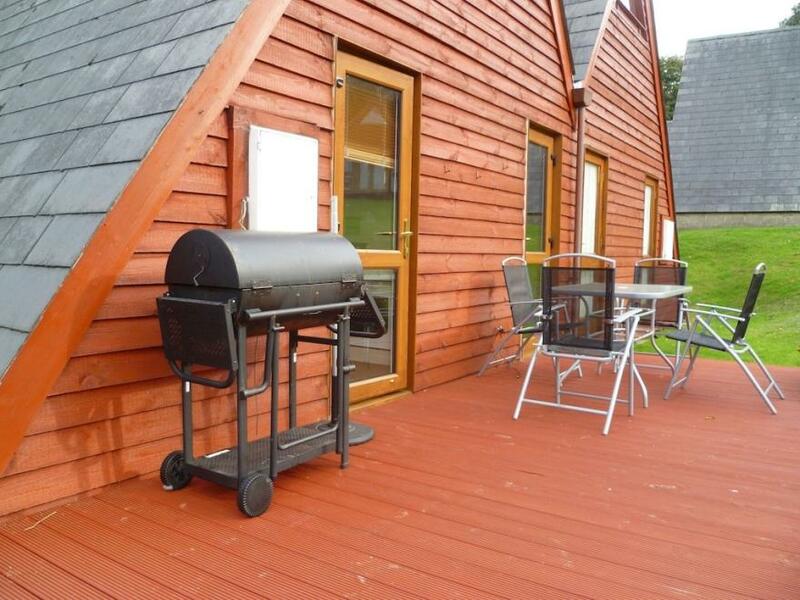 The chalet has 2 bedrooms sleeping 4 people and a sofa bed for 2 making it ideal for a party of 6. The chalet has heating and TV and has all amenities. The site is 1 mile from Sandown and on top of miles of sandy beaches. The site is ideally located for exploring the Island and is situated along major transport routes. Guest will have access to the entire property. We can be contacted by phone during your entire stay. Sandown is an old seaside town with a large amusement pier, zoo, crazy golf, dinosaur museum and loads of seaside shops. The number 8 bus passes the site hourly as it travels between Newport and Ryde The electricity in the chalet is paid for via a coin meter that takes 1 and 2 coins, which you will need to top up during your stay. The average cost is about 1.50 per day but can be considerably more in the colder months when the heating is on. You will have some electricity for when you arrive and we have more 1 coins available should you need some. Spacious lodge with one king size bed and one double, both with stylish ensuite shower and two twin. Large bathroom with bath and overhead shower. Contemporary open plan living space with a modern well equipped kitchen, breakfast bar and spacious family dining area. Patio doors leading to a spacious decking area, perfect for al fresco dining. Ideal for a relaxing break with large families or groups.. This oasis of opulent luxury and blissful relaxation nestles at the water’s edge on the Isle of Wight’s serene north-east shores, affording breathtaking views over the Solent. Backed by lush woodland and hosting abundant wildlife, Woodside Bay Lodge Retreat offers a haven of tranquillity just 10 miles from vibrant Cowes and 5 miles from Ryde – perfect for exploring this magical island. Each beautiful lodge bursts with premium contemporary design touches to create a sumptuous home-from-home – some with outdoor hot tubs – while the on-site treatment rooms, delicious restaurant and chic bar give the last word to indulgent unwinding. Stroll along the shingle beach bordering the park, or explore this Area of Outstanding Natural Beauty with its wealth of scenic, cultural, culinary and historic attractions.. This oasis of opulent luxury and blissful relaxation nestles at the water’s edge on the Isle of Wight’s serene north-east shores, affording breathtaking views over the Solent. Backed by lush woodland and hosting abundant wildlife, Woodside Bay Lodge Retreat offers a haven of tranquillity just 10 miles from vibrant Cowes and 5 miles from Ryde – perfect for exploring this magical island. All facilities available for all dates. *Charges apply.. Ferry Arrangements You’ll need to make a short ferry crossing (usually about 40 minutes) for your Isle of Wight holiday. Hoseasons special arrangements make it all easy for you. Please call for details. Spacious lodge with one king size four poster and one double both with stylish ensuite shower and two twin. Large bathroom with bath and overhead shower. Contemporary open plan living space including solid wood floors and a rustic electric woodburner in the lounge, modern kitchen, breakfast bar and spacious dining area. Patio doors leading to a spacious decking area perfect for al fresco dining with outdoor hot tub. Ideal for a relaxing break with large families or large groups.. This oasis of opulent luxury and blissful relaxation nestles at the water’s edge on the Isle of Wight’s serene north-east shores, affording breathtaking views over the Solent. 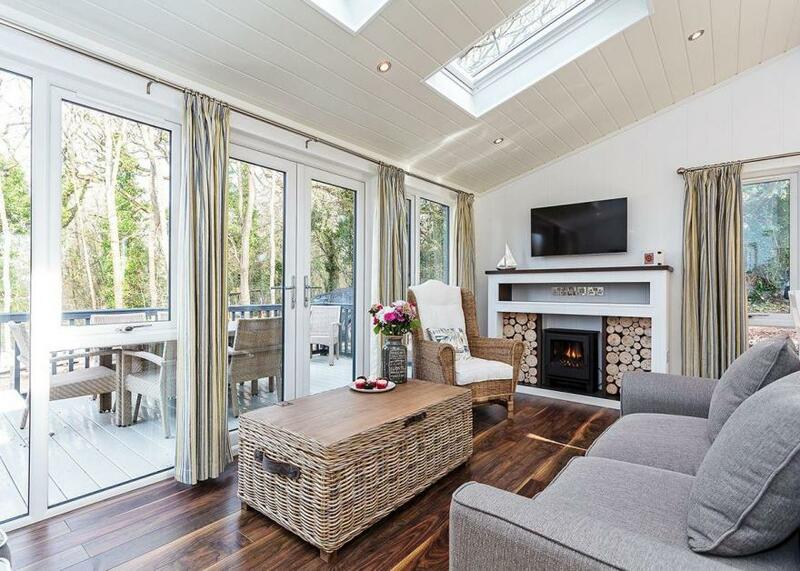 Backed by lush woodland and hosting abundant wildlife, Woodside Bay Lodge Retreat offers a haven of tranquillity just 10 miles from vibrant Cowes and 5 miles from Ryde – perfect for exploring this magical island.